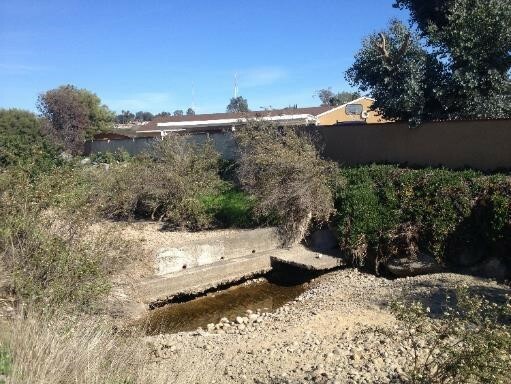 The VHRP Grant will fund Phase II construction of the Lenox Drive project to remedy mosquito breeding pools in Chollas Creek. Stagnant water has formed as a result of deteriorated grade control structures immediately north of the Lenox Drive Bridge (see photo). Due to the proximity of human activities (residential and recreational/hiking), mosquitos are a problem in this area; the County of San Diego Department Environmental Health (DEH) has identified this site as a high priority treatment area (Site 1702). The site is immediately adjacent to a residential community and is a known mosquito breeding habitat. In addition to the residences, hikers would also be affected by mosquito breeding habitat in this section of Chollas Creek. This important project is a component of Groundwork San Diego’s overall watershed and water quality improvement program, and is part of enriching the experience of the Chollas Creek.